How is NeoVision different from other laser centers? A: Laser vision correction (LVC) by NeoVision is very different than at many other laser centers. When comparing laser centers, you should carefully consider all aspects of the LVC surgery, such as the pre- and post-operative care, the dedication of the surgeon, and the laser equipments used. To help you understand this difference, NeoVision has produced a brochure titled “Marketing Gimmicks”. We strongly encourage you to read this brochure carefully so that you are able to choose your LASIK team wisely. In summary, NeoVision provides an honest assessment for your eligibility, the best surgery, quality follow-up care, and a fair price. We are very proud of our surgical protocols, surgical techniques, and state-of-the-art technologies. Remember! Decisions you make about your LASIK team will ultimately determine how well you will see day after day, for the rest of your life. How important is the choice of surgeon? What equipments are used by NeoVision for laser vision correction (LVC) surgery? NeoVision is committed to use the latest laser technology to give you the best vision after surgery. We believe that only the best equipment must be utilized with the best surgical team in order to achieve the best possible results. These machines are meticulously maintained in order to continue to achieve outstanding results. Corneal topographer and pachymeter are used to measure and identify corneal irregularities. These equipments identify patients who are medically disqualified for laser vision correction (LVC). Pupil measurements are also made to assess risk for night time vision problems such as glare and halos. For CustomLASIK, we use VISX Wavescan aberrometer which is the VISX implementation of Wavefront technology. The system works by bouncing a harmless infrared light off your retina. The reflected beam washes over the internal optical structures of the eye, emerging as a light wave. The shape of this wave, or Wavefront, is compared to that of the optically perfect eye to create a Wavefront error map. This map can be used diagnostically for pre-operative screening and post-surgical analysis, and is also used to generate the surgical plan for Wavefront LASIK treatment on the VISX S4. microkeratome for creating corneal flaps with a fixed corneal depth plate. Note that no assembly or coupling of microkeratome parts by the surgeon is required during the actual procedure. This minimizes the potential flap complications or human error. For premium surgeries, we use FDA-approved IntraLase laser to create corneal flaps that further minimizes microkeratome-related complications. VISX Star S4 Smooth Scan Laser which is one of the most advanced laser system available in vision correction surgery. It is FDA-approved for Wavefront LASIK treatment. The S4 offers Active Trak™, an infrared eye tracking systems that follows the eye in all three dimensions. Auto-centering eye tracking system automatically compensates for any of your eye movements during the laser treatment. The S4 also offers Variable Spot Scanning™, which uses seven variable-sized beams for faster, smoother and more precise treatments. The Blend Zone™ feature enables a larger treatment area and is available for those with larger pupils, to minimize nighttime glare. Note that we use the same Visx Star S4 laser for all LVC surgeries including standard LASIK, CustomLASIK, and IntraLase. All equipments are maintained and serviced exclusively by the original manufacturers to FDA approved specifications and are checked prior to treatment of each patient. For a complete list of technologies used by NeoVision, please take a Techonology Tour. What is an Excimer laser and how does it work? The Excimer laser produces a high-energy, cold, ultraviolet light beam in pulses and delivers the pulses to a surface of the eye’s cornea. These pulses break the bond between molecules and tissue cells so that a controlled amount of tissue can be vaporized away to reshape the cornea. Excimer laser beams do not disturb the underlying eye structures such as iris, lens, and retina. The Excimer laser is computer controlled and programmed to treat each individual eye with a high degree of precision. How much corneal tissue is removed in LASIK? For most cases, the thickness of the layer removed by the laser is less than the thickness of a human hair. Actual thickness of layer depends upon the treated correction. How much nearsightedness can be corrected by laser vision correction surgery? Most refractive surgeons now believe that -12D is the upper limit for good patient satisfaction, although LASIK can be used effectively under certain circumstances for prescriptions as high as -15D. Above these levels, other procedures involving the implanting of lenses inside the eye will probably become the procedures of choice. PRK is also approved by the FDA for treatments of high myopia. However, most surgeons prefer LASIK to PRK when treating more than 4D of myopia. Corneal thickness measurements are very important and this also limits the amount of correction that is performed. People previously “disqualified” based on the corneal thickness may now be eligible for LASIK with the IntraLase laser. Both PRK and LASIK are possible and effective for correcting hyperopia. The procedure is identical to the myopic (nearsighted) procedure, however by blocking the laser from treating centrally and allowing it to remove more tissue in the periphery of the cornea, a steepening rather than a flattening of the cornea is produced. 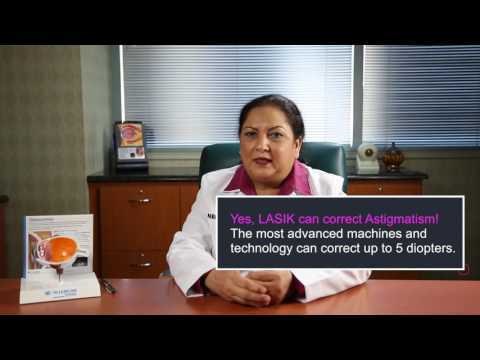 How does LASIK for astigmatism work? The laser software is capable of treating the cornea in an elliptical fashion to correct the astigmatism. Can any of the present laser vision correction procedures correct presbyopia? No. None of the current LVC procedures can correct presbyopia. If you are presbyopic, monovision is an option to help correct both your distance and near vision. The monovision procedure corrects the focus of one eye for distance vision and the other eye for near vision. Monovision is a compromise of both distance and near vision. Depth perception is also affected. For people with high visual demands like sports or constant near work (i.e. reading), we recommend full distance correction, and glasses for near vision. A trial period with contact lenses or glasses may help determine if monovision would be a good option for you. How is LASIK advantageous over PRK? Healing time, stability, and post-operative pain are all significantly less with LASIK. PRK may result in haze, which could be temporary. When is PRK preferred over LASIK? Some patients have thin corneas relative to the amount of treatment needed to correct their prescription. Other patients have an abnormal epithelium (the outer layer of the cornea) that would be more prone to an abrasion during LASIK. Either of these two conditions would make PRK the preferred procedure. If I have had a previous corneal injury, can I have LVC surgery done? It will depend upon the size and type of injury. A comprehensive eye exam is needed to fully determine if you are a good candidate for laser vision correction (LVC). If I have PRK, what kind of vision can I expect the following day? Vision is greatly improved but typically blurry immediately after the procedure. It generally starts to improve once the surface layer of the cornea (epithelium) has grown back, which in most cases takes 3 to 4 days. Vision typically starts to get good within 7-10 days but can continue to be blurry for a number of weeks. For most patients, vision stabilizes within 3 months (some may take 6 months or longer). The healing process varies for each patient, and it is difficult to predict precisely when you will achieve your best visual acuity. However, most patients who have both eyes treated at the same time report that they are able to drive a car safely and resume their normal activities between 3-5 days following PRK. What is the key difference in conventional, custom, and IntraLase LASIK? The key difference in different techniques is either in the quality of vision (CustomLASIK is better) or the safety of procedure (IntraLase is safer). As far as visual acuity is concerned, generally the first day after laser vision correction, most patients experience a large improvement in their vision, to approximately 20/40 or even better. This greatly depends on your preoperative prescription. You can expect to regain approximately 75 to 80% of your vision in the first two to three days after surgery. The remainder of your vision will improve gradually over several weeks. If you have significant astigmatism, or are very near-sighted / far-sighted, vision recovery and stabilization are slower. Radial Keratotomy (RK) is the oldest of the modern refractive procedures. RK can correct nearsightedness by changing the shape of the cornea. Microscopic incisions of 90% depth, placed in a radial pattern, like the spokes of a wagon wheel, reshape and flatten the central cornea, allowing light to focus more precisely on the retina. The length and number of incisions determine the effect of the surgery. Patients with less than 3 diopters of nearsightedness and stable prescriptions are the best candidates. Today, RK is seldom performed because the Excimer laser can achieve the same effect without the need for placing deep corneal incisions. One major concern about RK is the weakening effect of the radial incisions on the strength of the eye, which makes the eye more susceptible to rupture in the event of an injury. Another concern is that eyes with radial keratotomy can experience progressive flattening, making them farsighted over time. These problems are avoided today through the use of other procedures, such as LASIK. What is automated lamellar keratoplasty (ALK)? Automated Lamellar Keratoplasty (ALK) for nearsightedness is a procedure that has been replaced by LASIK in recent years. ALK corrects nearsightedness by removing a thin layer of tissue from the cornea to flatten the eye’s surface. Unlike RK, which flattens the eye by making incisions into the surface, ALK actually removes a thin disk from the cornea, leaving it thinner and flatter than it originally was. The disadvantage of ALK is that it is not nearly as accurate as the Excimer laser for the tissue removal step, so multiple procedures are sometimes needed to achieve the final correction. LASIK is a combination of ALK and PRK. Why has LASIK become the procedure-of-choice? Because the healing occurs in the interior of the cornea, and no re-growth of surface cells are required. The corneal flap protects the treated area and there is usually little or no post-op discomfort. Visual rehabilitation is much quicker. WaveScan technology was originally developed for use in high-powered telescopes to reduce distortions when viewing distant objects in space. This technology has now been applied to laser vision correction, measuring imperfections in the eye never before measured using standard methods for glasses and contact lenses. WaveScan-based digital technology identifies and measures imperfections in an individual’s eye 25 times more precisely than standard methods. Like fingerprints, no two Wavefront eye maps are alike. LASIK surgeons use this information to treat individuals with the CustomVue™ procedure. Why is WaveScan technology so important to the CustomVue™ procedure? Until now, physicians were forced to practice one-size-fits-all vision. An off-the-shelf lens corrects an individual’s vision fairly well, but it does not correct it precisely because it is not uniquely tailored to that person’s fingerprint of vision. For the first time, WaveScan technology captures unique imperfections in each individual’s vision that could not have been measured before using standard methods for glasses and contact lenses. Who is a candidate for VISX CustomVue procedure? If you are 21 years of age or older and wear glasses or contacts to correct nearsightedness, farsightedness and / or astigmatism you may benefit from CustomVue™. If you meet the criteria, you should see your eye doctor for more information. How should I decide whether to choose CustomVue? The first step is to contact NeoVision Eye Center to schedule a complimentary personal vision assessment to determine if you are an appropriate candidate for laser vision correction and CustomVue. A WaveScan measurement will be taken to map the unique characteristics of your vision. The surgeon will assess several criteria including level of correction, and overall eye health and discuss the benefits and risks of the procedure. After considering the benefits of CustomVue and discussing your options with your LASIK surgeon, you will be in a much better position to decide if CustomVue Wavefront guided LASIK is right for you. How does IntraLase laser work? IntraLase laser beam places a series of computer-controlled, tiny (3-micron-diameter) bubbles within the central layer of the cornea. This pattern results in a precise corneal flap at a depth and diameter determined by the surgeon. As with a mechanical microkeratome, a small section of tissue at one edge of the flap is left uncut, forming a hinge that allows the surgeon to fold back the flap and reshape the corneal bed with the Excimer laser. Is there a difference in the visual outcome of IntraLase and standard LASIK? Recent studies show that more people achieve 20/20 or better vision with an IntraLase flap than with a microkeratome-flap and have a lower incidence of post-operative dry eye. IntraLase patients in the studies also required fewer enhancement(“touch-up”) procedures. Is there a difference in the quality of corneal flaps created by IntraLase and traditional microkeratome? The IntraLase flap follows the curvature of the cornea and produces a flap with vertical edges, unlike the edges left by a microkeratome. This difference in flap architecture may reduce the chance of corneal epithelial ingrowth, a potential complication of standard LASIK. IntraLase laser also avoids improper corneal flaps such as partial and “buttonholed” flaps, epithelial sloughing, corneal wrinkles and flaps that are too thick. IntraLase flaps appear to adhere more tightly to the corneal bed at the end of the procedure. Laser-made flaps demonstrate a more aggressive healing response at the edges compared with microkeratome-made flaps. Can IntraLase make flaps in people with small, deep-set eyes or people with thinner and flatter corneas? Yes, IntraLase is more likely to make corneal flaps successfully in such people. When was IntraLase approved by FDA? IntraLase was approved by FDA in 2002. Since then more than 100,000 IntraLase procedures have been done. What are the risks and complications associated with laser vision correction (LVC) surgery? Halos / Starbursts: Some patients will notice glare, halos or starbursts around objects at night or in dim-light conditions. Patients who notice these effects may need to wear glasses to drive at night. For the vast majority, these symptoms are temporary. However, others will continue to experience them for several months or longer. During your pre-operative evaluation, we will determine whether or not you are at high risk for seeing long-term halos. These side effects tend to be less noticeable the closer you get to the ideal correction of your refractive error. Note that CustomLASIK reduces the frequency of glare, halos or starbursts problems following treatment and results in clearer, crisper vision compared to treatments performed by conventional LASIK. Dry eyes: Increased dryness of the eyes is a common, but generally temporary, complication arising from LASIK, CustomLASIK, IntraLase, or PRK. It typically lasts for several months, though some patients may experience dryness for a longer period of time. It is important to use lubricating drops frequently. If the eyes remain dry for prolonged period, there are other drops or techniques that can help. Patients who have dry eyes prior to the procedure are likely to experience dry eyes after the procedure. Infection: All eye surgeries carry with them the possibility of infection. This is an extremely rare occurrence, with a 1 in 10,000 treated eyes. Fortunately, as the laser vision correction techniques have developed over the years, firmly established protocols now exist which dramatically minimize the risk of infection. Most infections respond well to antibiotic treatment. Diffuse Lamellar Keratitis (DLK) or “Sands of the Sahara”: Some patients develop an inflammatory reaction between the flap and the corneal bed, called Diffuse Lamellar Keratitis (DLK) or “Sands of the Sahara.” Patients with DLK may not show any symptoms at all or may experience blurred vision and tearing. DLK can generally be treated with eye drops and rarely results in any permanent impairment of vision. Retinal detachment: Although retinal detachment is not usually considered a specific complication of laser vision correction surgery, it is at least a possibility. Even without any surgical intervention, myopic patients are always at risk for retinal detachment and LASIK may not alter this risk. Anesthesia or drug reactions: As with all types of surgery, there is a possibility of complications due to anesthesia, drug reactions, or other factors which may involve other parts of your body. The patient must inform the doctor if they have ever had a reaction to any kind of anesthesia. Corneal scarring: There are corneal irregularities which can rarely occur. The worst case scenario could be corneal scarring. The risk of corneal haze or scarring is more in PRK than in LASIK. Equipment malfunction: The microkeratome, IntraLase and Excimer lasers have proven to be very elegant, very dependable devices for creating the corneal flap and reshaping the cornea. Nevertheless, we are working on the cornea which is about 0.6mm thick, and as with any device, the microkeratome, IntraLase, and Excimer laser are not perfect. In spite of out best efforts, there are times when they produce a less than ideal result. We will not begin your procedure unless our equipments are functioning properly. Additionally, we might have to stop at the safest possible point if a malfunction should develop. Surgical team: The less the experience of the surgeon and team, the greater is the risk. But even with the best available equipment and the most experienced surgeons, complications can and do occur. The only way to avoid all risks of surgery is not to have the surgery done at all. As a generality, the more serious the risk, the less likely it is to occur. Vascular occlusion: When the suction ring is applied to the eye to create a corneal flap, the pressure inside the eye increases significantly and most patients notice either a dimming or a complete loss of light in the eye. As the suction ring is removed, the vision is restored within a few seconds. There is a less than 1 in 1,000,000 probability that when the suction ring interrupts the blood supply to the eye, permanent damage to the retina and loss of vision can result. Note that unlike microkeratome, IntraLaseemploys a suction ring that uses low vacuum. Increased pressure in the eye: The drugs used during the first week after surgery, on rare occasions, may cause increased pressure in the eye. This raised pressure needs to be closely monitored and may require additional topical and/or oral medications. It is important for you to return to NeoVision Eye Center for scheduled follow-up visits to monitor your eye pressure in order to modify the medication schedule as needed. Eyelid droop: The eyelids have a natural tendency to droop with age. The eyelid speculum that is used in the procedure may hasten this process. Corneal ectasia: A certain minimum amount of corneal tissue must remain under the flap after the laser has achieved tissue removal. The amount of remaining tissue relates directly to the long-term stability of the cornea. Less than optimum remaining cornea may result in bulging, called ectasia. This problem can be avoided by precise pre-operative measurements and creating an optimum corneal flap during surgery. Improper corneal flap: The corneal flap may be of improper or irregular thickness or incompletely cut. Such problems may require that the procedure be stopped until the surgeon can safely cut a new flap. There is also a small risk that the hinge of the flap may be cut from the cornea (also known as a “free flap”). In most instances of “free flap” the surgeon can still perform the laser treatment. This detached flap is repositioned and covered with a bandage contact lens to promote healing. Note that the IntraLase laser may avoid partial and “buttonholed” flaps, corneal wrinkles, and flaps that are too thick. Epithelial defects: The epithelium in some eyes is only loosely attached to the corneal surface. Such eyes are at increased risk for epithelial erosions or defects, especially as the microkeratome passes over the corneal surface. In some cases, this risk is identified before surgery and the patients are advised accordingly. There are, however, occasional patients where there are no pre-operative clues. In addition, older patients are more likely to have occult areas of this weakened skin. Note that the IntraLase laser may better avoid some of the epithelial irregularities and sloughing. Epithelial ingrowth: Epithelial cells can appear as either “isolated pockets or nests” under the LASIK flap. This may result due to improper healing at the edge of the flap. Most of these are fairly easy to successfully eliminate. Note that the IntraLase flap follows the curvature of the cornea and produces a flap with vertical edges, unlike the edges left by a microkeratome. This difference in flap architecture may reduce the chance of corneal epithelial ingrowth. : The healing response of the eye occasionally counteracts the precisely calibrated removal of tissue by laser. While the treatment of your refractive error is designed to completely neutralize your refractive error (unless otherwise agreed upon with your surgeon) this treatment is based on an average eye’s healing response. If your eye heals differently from the “average”, this may result in an over- or under-correction. A patient’s tolerance for under-correction or over-correction varies. In majority of instances, the over- or under-correction can be corrected with glasses, contact lenses, or additional surgery. It is important that you understand this possible outcome and accept it as one of the risks of surgery. If this should occur, you will probably be disappointed with your result. Under- or over-corrections are actually the most common undesirable result or complication of surgery. Significant over-corrections occur about 1% of the time. Re-treatment or enhancements: The vast majority of patients require only one refractive treatment. Due to each individual’s prescription level and unique physiology, however, an additional treatment or enhancement may be required. The additional procedure can involve all of the risks and side effects as discussed before for the primary procedure. As always, this risk should be weighed against the expected or desired benefit. The patient must generally wait at least three to six months after the first treatment and must have adequate corneal tissue and stable vision. Results cannot be predetermined or guaranteed. What are the long-term effects of laser vision correction? Although LASIK and PRK are relatively new procedures, results from U.S. studies to date show that 95-98% of patients with mild to moderate myopia who have undergone PRK have achieved stable 20/40 distance vision or better with one treatment. Although a 1-2% of eyes will lose a line of best correctable vision, no significant long-term sight threatening consequences have been reported in ten year follow-up from international centers. Is laser vision correction (LVC) surgery safe during pregnancy and nursing? There are two concerns related to doing LVC surgery when a woman is pregnant or nursing: 1) There are hormonal changes during this time that could affect the measurements of myopia, hyperopia, or astigmatism. 2) Medications (sedation, pain medication, even eye drops) can be transmitted to the fetus by the mother’s bloodstream or to the baby through breast milk. For these reasons, we strongly advise against refractive surgery while you are pregnant or nursing and urge you to let us know if you are nursing or if you are or could be pregnant. We recommend that you wait at least 3 months after delivering a baby or wait until after your second menstruation period or cessation of lactation before undergoing LVC surgery. Are LASIK and PRK approved by FDA? Yes, both the procedures are approved by FDA. Specific amounts of correction approved for treatment vary according to specific laser manufacturers. Will I be hospitalized for laser vision correction surgery? No. LVC surgery is an out-patient surgery. There is no need for hospitalization. How long does the laser vision correction surgery take? Once you are comfortably positioned beneath the laser, it takes approximately five to seven minutes per eye to complete the procedure from start to finish. The actual laser treatment time takes just 15-90 seconds, depending on the degree of correction required. Total time at the laser center on the day of the procedure will be about an hour. Yes. Your surgeon will need you to fixate on a red blinking light in the microscope during the procedure. This will ensure that the tissue removed will be centered over your pupil. Will I be in any pain during and after the laser vision correction procedure? There is no discomfort at all during the LASIK or PRK procedure. You will be awake and comfortable throughout the procedure. Following the PRK procedure, expect a gritty sensation with some mild to moderate discomfort in the first few days, which will improve with time. LASIK procedure is also painless; however, there is about 30 seconds of firm pressure while the corneal flap is being created. Following the procedure, patients are slightly more comfortable than patients undergoing PRK, experiencing only a 4-6 hours of scratchiness in the eye. Sleep during these first hours immensely reduces any discomfort you may feel. Can I have both eyes treated or must I do one at a time? Most patients undergoing LASIK prefer to have both eyes treated on the same day. There are pros and cons to this approach but most people would like to minimize any postoperative discomfort and time off from work. This is entirely up to the patient. PRK is not performed on both eyes the same day, and a waiting period of approximately two to three weeks is recommended. This is an issue that should be discussed with your surgeon. Should I be nervous about the procedure? It is perfectly natural to be nervous about having the procedure. Your LASIK surgeon, Dr. Shobha Tandon will spend a great deal of time describing exactly what’s involved in the procedure. She will “walk you through the process” to make you as comfortable as possible. Will my work, hobbies, vacation, trips, etc. be affected? Most likely not. However, it is conceivable that your vision could have a delay in recovery such that there could be a problem doing your work or a hobby or interfere with taking a trip or vacation. You will be asked to restrict certain activities for about 1-2 weeks. You should try to always have more than enough time between your surgery and something you really need or want to do, especially if the activity requires good vision. How will my present or future employment be affected? No one knows. You should be aware that some agencies or organizations that have physical or visual requirements for participation, governmental or otherwise, including the military, FAA, airlines, fire departments, law enforcement, and possibly others, may at the present or may in the future, decide to impose limitations on various physical conditions including having LASIK surgery or other refractive surgery. NeoVision Eye Center cannot be responsible for keeping current on the legislation of every conceivable organization, either locally or nationally. If there is a particular group that you are either a member of or anticipate the possibility of joining as a member, you must verify the requirements before having such surgery. How much time do I need to take off of my work? Most people can return to work the next day. This is due to the fact that most people see well enough to drive the day after surgery. What should I do prior to my surgery day? Depending upon your occupation, you may need to arrange to be away from work for up to 4 days following your surgery. You may eat a light meal prior to surgery. You must avoid the following 24 hours before your procedure: Alcohol, Caffeine, Cigarettes, and Anti-histamines or allergy medications. You should not plan to drive long distances for approximately 3 days after LASIK and 7 days after PRK. Please remove all facial make-up (lipstick, facial cream, eye make-up etc.) a minimum of 2 days prior to surgery. For your safety, surgery will be cancelled if make-up is present. The evening before surgery, we suggest soaking your eyes in a warm washcloth to remove all eye make-up. Purchase your eye drops from your local pharmacy, antibiotic and Refresh Tears (preservative free) the day before your scheduled surgery. You will be given a prescription before your surgery. What should I do on the day of my surgery? Please note that you may feel nervous, anxious, or excited prior to your procedure. This is a natural, normal response. Please refrain from wearing perfume, cologne, hair products, body lotion, scented deodorants, and soap on the day of your surgery. Please pre-arrange for transportation, you WILL NOT be able to drive. Please be advised that after your surgery your eyes will be irritated and light sensitive. This usually dissipates within 24 hours after surgery. We recommend avoiding alcohol 24 hours prior to and 48 hours after your surgery, as this tends to dehydrate the tissues. Wear comfortable clothing on your surgery day. You can bring a sweatshirt to wear during the procedure. Procedure room temperature is controlled at 68-70 degree F. Avoid clothing such as wool that may generate lint in the surgical suite. Plan to arrive 30 minute before your scheduled surgery. Plan to stay upto two hours at the center for your scheduled procedure. What are the post-LASIK instructions? After laser surgery most patients experience a general scratchiness or foreign body sensation with some tearing. Some pain and discomfort are normal. Sometimes eyelid may be swollen or droop a little. You may be sensitive to bright light for some time. After surgery, keep your eye(s) closed for about two hours, then gently open and start using the drops as directed. For pain, you can take Vicodin tablet if prescribed. We use three kinds of topical drops post-operatively. One is an antibiotic to help minimize the chance of infection; the second is an anti-inflammatory to help minimize inflammation excess; and the third is a tear lubricant, provided to help the superficial corneal cells remodel and remain moist. The antibiotic and anti-inflammatory drops are used for approximately one week, while the teardrops are used for at least one to three months. You should start using antibiotic eye drops, Zymar, every two hours for the first day then four times a day for five days. Predforte anti-inflammatory drops, use one drop every two hours for the first day then four times a day for five days. Shake the bottle before use. Preservative-free lubricating drops (Refresh Plus) can be used every hour and as needed for feeling of dry eyes. If you are using all the drops at the same time, use five minutes interval between two drops. To instill the eye drops, pullout lower eyelid and instill the drop gently. Blot dry the excess rolled over drop on your face. Do not rub or put pressure on your eye. How will I see immediately after surgery? Immediately following surgery, patients often comment that, although they can see, their sight is similar to opening their eyes under water. This lasts for a few hours, and then dramatically improves the day after surgery, and weekly after that. How will my eyes feel following LASIK? Tenderness to touch for few weeks. What precautions should I take following surgery? You may shower or shampoo but keep your eyes closed for first two weeks. Soap or shampoo should not go inside your eye. After shower, very carefully dry the face without pulling your eye. How soon can I resume my normal activities following LASIK surgery? How soon can I take a bath or shower after surgery? You can take shower or bath the day after surgery. Avoid getting soap or water in your eyes. You may resume exercises as you wish. Don’t get sweat in your eyes. Try to keep your hands clean and away from your eyes. Swimming, however, should be avoided for at least two weeks. It is a good idea to buy new mascara after surgery to avoid infection and it is best to wait for 1 week before using eye makeup. You can resume driving as you feel comfortable with your vision. About 90% of patients are able to drive on their own on the day following LASIK. With PRK, it usually takes about 4-5 days to feel comfortable. You should avoid driving while under the influence of any medications taken following surgery. How about flying or SCUBA diving following surgery? Patients often are concerned about the pressure changes during flying or SCUBA diving after refractive surgery. These pressure changes will not affect your eye or the outcome of your surgery. It is okay to fly at anytime after refractive surgery. The use of non-preserved artificial tears is recommended while flying for perhaps up to 6 months after the surgery. We would recommend waiting at least one month after your surgery for SCUBA diving because of infection from water and possible rubbing or bumping the eye with the mask. What are the chances of eye infection after LASIK surgery? Infection following laser surgery is extremely rare. However, if it does occur, it is important to catch it early to prevent any damage. Signs of infection include a white spot on the cornea, redness that persists beyond one day, eyelid swelling, pain and discharge. These could all simply be the side effects of surgery. If you are concerned please call our office. Please bring the medications with you on each of your visits. If you have any questions, please call us toll free 1-877-NEOVISION (1-877-636-8474). If you are calling after office hours, please identify yourself to the operator by saying that you are a surgery patient. How many post-operative visits are required? All patients require visits the day after surgery, one week, one month, three months, six moths, and twelve months after surgery. Routine annual exams are always recommended, whether or not you have surgery done, to make sure that your eyes are healthy. What will be my night time vision after the surgery? There are some patients who feel that their night or reduced-light vision is poor after surgery even when their uncorrected vision is good or excellent in normal lighting. This may be a significant issue for some patients while driving at night, playing tennis or baseball at night, or while participating in similar activities occurring in low lighting conditions. If activities of this sort are very important in your lifestyle, be sure to discuss it with your surgeon. Note that the CustomLASIK reduces frequency of night vision problems following treatment and results in clearer, crisper vision compared to treatments performed without CustomLASIK. What are the realistic laser vision correction outcomes and expectations? The goal of any refractive surgical procedure is to reduce or eliminate your dependence on corrective lenses so that you may freely enjoy activities without the encumbrance of corrective glasses or contacts. It is very important that your expectations are reasonable and that you understand the possible scenarios in which your expectations might not be met. In general, the higher the myopia and / or astigmatism you begin with, the less likely you are to have an ideal outcome. Will I need to wear glasses and/or contact lenses after surgery? Patients may still need or want to wear glasses following refractive surgery for certain tasks even though almost everyone will see vastly better without glasses than they did before surgery. Some patients, especially those over 40, will need glasses for close work such as reading, sewing, computer use, etc., even though they might have good visual acuity for farther away objects. If you were able to wear contacts prior to surgery, you should be able to wear contacts afterwards. There may be some increase in difficulty due to the new shape of the front of the eye; however, it is very unusual for patients to require significant corrections after surgery. Most normally sighted patients require readers in their mid-forties. This is caused by the normal weakening of the focusing muscles of the eye known as presbyopia, which usually starts around the age of 40 – 45. This condition occurs with or without LASIK. Those patients who currently have bifocals will still need reading glasses after the surgery unless they opt for a treatment plan called monovision, wherein one eye is corrected for distance and the other for near vision. At some point in your 40’s you will probably need reading glasses for close viewing, whether or not you had refractive surgery. How will I update my restricted driver’s license? You will need to notify DMV that you have had your refractive error corrected with LVC. They will inform you how to go about changing the information on your driver’s license. In the interim we will be able to give you a signed document attesting to the fact that you had the surgery done and your current level of uncorrected visual acuity. The vision correction is permanent. However, your vision may change naturally with time and LASIK does not affect visual conditions that may develop with age. Also, the Excimer laser permanently reshapes the front of the cornea by removing small amounts of tissue typically less than the thickness of a human hair. This tissue that is removed does not grow back thereby making the correction permanent. What are NeoVision’s charges for laser vision correction (LVC) surgery? At NeoVision Eye Center, we believe the fairest approach is to offer LVC for one Flat Fee. That is why we offer one global comprehensive LVC fee, which includes all pre-operative, surgical, and post-operative care for one year for standard (conventional) LASIK. For optional upgrades such as CustomVue WaveScan andIntraLase, there is an additional charge per eye. Our fees do not change by the prescription, by the laser technology, by the amount of care needed, or by the surgeon. We do not believe in advertising misleading prices. Will my insurance pay for laser vision correction (LVC) surgery? LVC is an elective procedure. As a result, generally insurance companies do not pay for vision correction procedures. You can check with your plan administrator to find out what is your coverage. Can I use my flex spending account to pay for laser vision correction (LVC) surgery? LVC fees can be covered by medical flex / cafeteria plans that allow pretax dollars to be set aside. We encourage you to explore if a medical reimbursement account (i.e. medical flex / cafeteria plan) is offered through your employer. This is a popular way to help pay for your LVC. Money set aside in a medical reimbursement account can often be a significant pre-tax savings. Schedule a free screening now to confirm if you are a candidate for LVC so you are ready to apply for your medical reimbursement savings account. Is laser vision correction (LVC) fee tax deductible? Yes, LVC fee is generally tax deductible as a medical expense. For your unique situation, please check with your financial advisor. laser vision correction procedures, cosmetic surgery, or any other surgical procedure requiring payment in advance, can be paid for in a number of ways. NeoVision Eye Center has allied with several lending institutions to offer competitive financing options for our patients. The “Same as Cash” financing option allows you to have the procedure right away and make payments interest free over the next 6 months. You may also apply for the standard financing option. It gives you the convenience of payments that works like a personal loan. You select a term of 24 to 48 months along with the amount you need. Your monthly payments could be less than $50 per eye. Please ask for further details or an application. Applying for financing consists of a very short form, literally taking less than 5 minutes. Interest rates and down payment requirements are solely dependent upon credit rating. Do you offer any educational seminars on LASIK? Yes, we do. 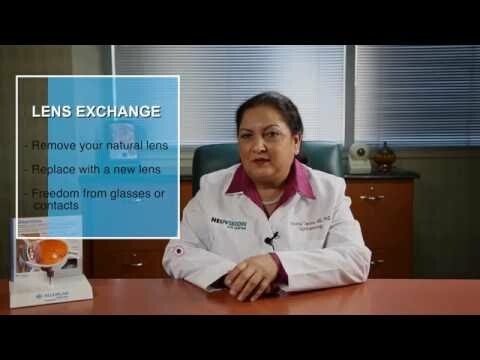 Dr. Tandon regularly talks about her experiences with laser vision correction (LVC) and answers questions about LVC and eye care. You have the opportunity to meet previous patients and ask them how they are doing with their new vision. What laser vision correction (LVC) surgery is right for me? We at NeoVision perform a very thorough individual evaluation to determine your suitability for the LVC surgery. Determining the right procedure based upon your profession and overall lifestyle is very important. There are many considerations to make before recommending a procedure that would best suit you as an individual. We will advise you on the treatment option best suited to your eyes, whether that is LASIK,CustomLASIK, IntraLase, PRK, or no surgery at all. In approximately 10-15 percent of cases, we find that people are not ideal candidates for refractive surgery, and we will counsel you accordingly. In general, a good LASIK candidate is at least 18 years old, has healthy corneas, and has maintained a stable eye prescription for the last 12 months. What medical conditions may exclude me from the laser vision correction (LVC) procedures? How long does the initial complimentary screening take? The total screening may take from 30 to 45 minutes. Dr. Tandon is very careful in deciding which patients are good potential candidates for laser vision correction (LVC) and she educates each patient about the expected outcome and inherent risks associated with laser surgery. She will advise you on the treatment option that is best suited to your eyes, whether it is LASIK, CustomLASIK, IntraLase, PRK, or no surgery at all. Remember, many serious problems occur when people who should be medically disqualified are given the surgery anyway. How long does the pre-operative evaluation take? Your LASIK surgeon, Dr. Tandon, will examine your retina and optic nerve, as well as perform a detailed corneal study. The total consultation may take from 60 to 90 minutes. Please bring someone to drive you home afterwards, as it is not safe to drive for several hours after your pupils have been dilated. How critical is it that my LASIK surgeon performs my pre-op evaluation? In-depth pre-op exam is the MOST crucial part of your LASIK surgery. The entire laser treatment is based upon the results of pre-op exam. Obviously, the more accurate the pre-op data, the better your visual outcome would be. Don’t let some non-medically qualified staff member perform this exam on you. Other staff members may be involved in your care as well, but there is no substitute for the personal commitment of your surgeon for your care. Remember, at some laser centers, patients see their surgeon for first time on the day of the surgery; not before and never thereafter. Do I need to stop wearing contacts prior to initial exam and the procedure? Yes, you will need to discontinue wearing contact lenses prior to pre-operative evaluation as well as laser vision correction procedure. Contact lenses can “warp” the corneal surface, which changes the corneal curvature and leads to a refraction that is not representative of your true refraction. In order to properly calculate the treatment to correct your refractive error, you will have to stop wearing contact lenses at some stage prior to surgery. The time interval that you must go without wearing contact lenses depends on the type of lens that you use and the length of time you have used them. Exceptions to these rules exist and you should discuss this with your laser surgeon. Soft contact lenses must not be worn for at least one week prior to the pre-operative exam and procedure. Soft extended wear or soft toric contact lenses must not be worn for at least two weeks prior to the pre-operative exam and procedure. Hard toric lenses must not be worn for at least four weeks prior to the pre-operative exam and procedure. Gas permeable contact lenses (RGP) must not be worn for at least six weeks (or eight weeks if you have worn them for more than 20 years) prior to the pre-operative exam and procedure. True hard lenses (PMMA) must not be worn for at least twelve weeks prior to the pre-operative exam and procedure. I am ready to get rid of my glasses/contacts, what is the next step? Schedule a complimentary, no-obligation personal LASIK evaluation with your LASIK surgeon at NeoVision Eye Center to determine if you are a likely candidate for Laser Vision Correction. There is absolutely no-fee for this assessment, whether or not you choose to have the procedure done. Call toll free at: 1-877-NEOVISION (1-877-636-8474).